An Ordinary Life : Science: How does a plant drink water? Science: How does a plant drink water? We all know that all plants need water to survive, even the ones that live in dry places like the desert. Plants need water to keep their roots, stems, leaves, and flowers healthy and to stop them from drying out and wilting. The water is also used to carry dissolved nutrients throughout the plant even though the plants main source of energy is, of course, the sun. Most of the water a plant gets will be from the ground so how does the plants transport this water all the way from the roots to the stem, leaves and flowers? They do it through something called capillary action which is also know as capillary attraction or capillarity. Capillary action happens when the two forces, cohesion and surface tension occur, these two forces bind a liquid together then there is another force called adhesion, being a surface that attracts the liquid to it. When these forces are greater than the force of gravity this is when capillary action occurs. It is defined on line as: a phenomenon associated with surface tension and resulting in the elevation or depression of liquids in capillaries. 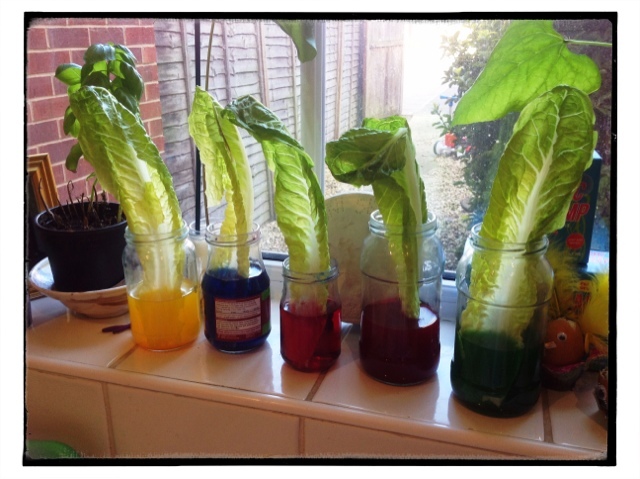 A simple way of seeing capillary action is to get a piece of kitchen roll, some water will a bit of food colouring in and by just placing the corner of the piece kitchen roll in the liquid you will see the coloured water draw up through the paper, defying gravity. This is what happens inside a plant. We used lettuce leaves in our project this year, but you could use a flower instead, white carnations are a good one to use. 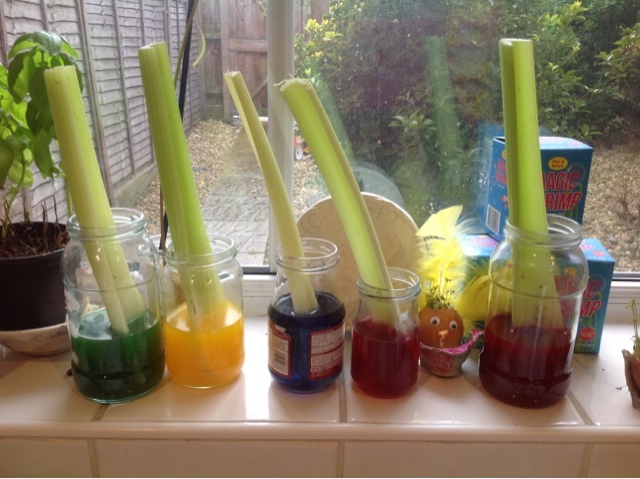 If you do use a flow this will give children the chance to label the different parts of the plant as well. 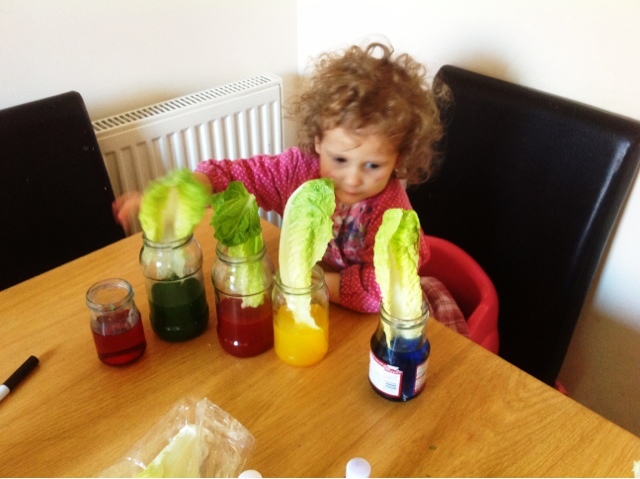 At least one glass jar but, if like my girls you want to try more than one colour you may need more. We used 5. Lettuce leaves. (You can use celery, or flowers too). A science journal - this is optional. 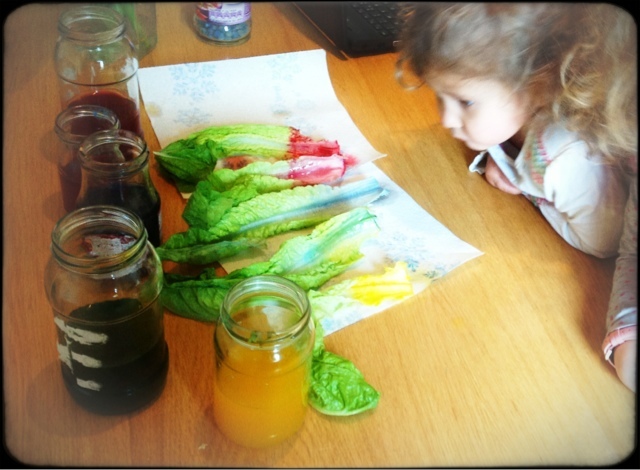 First add about 10 drops of food colouring in each of your jars. Add 200ml of water in each of them. 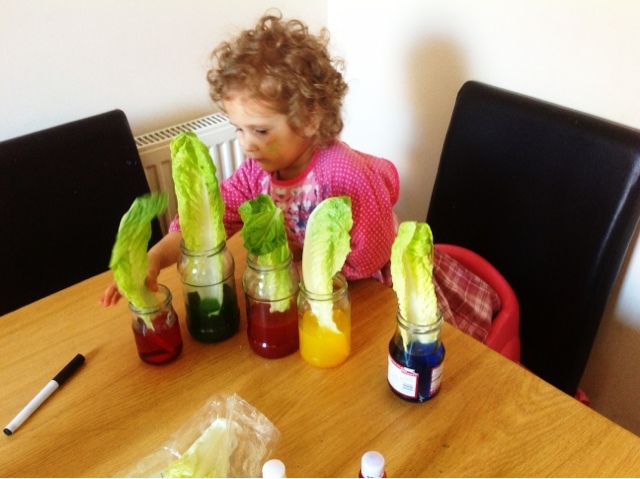 Put one lettuce leaf, celery stick or flower in each jar. 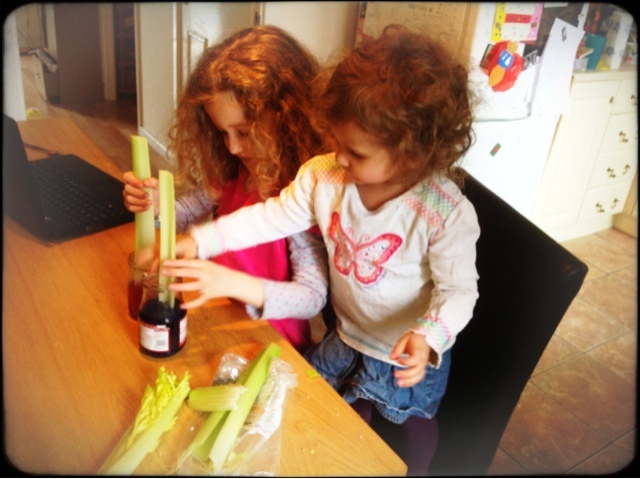 Whether you use Lettuce leaves, celery or flowers you must remember to cut the bottom of the stems at a diagonal angle of about 45⁰ as this will help the plant draw the water up better, do remember to cut it with a knife though, not scissors. The reason that this helps the plant take in more water is because cutting the flower stem at this angle allows the stem to have a greater surface area for water consumption.